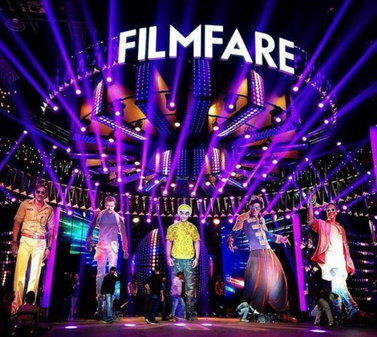 The 60th Filmfare Award Ceremony was held on 31st January 2015 in Mumbai. Except few good awards the show had gone to haywire literally. 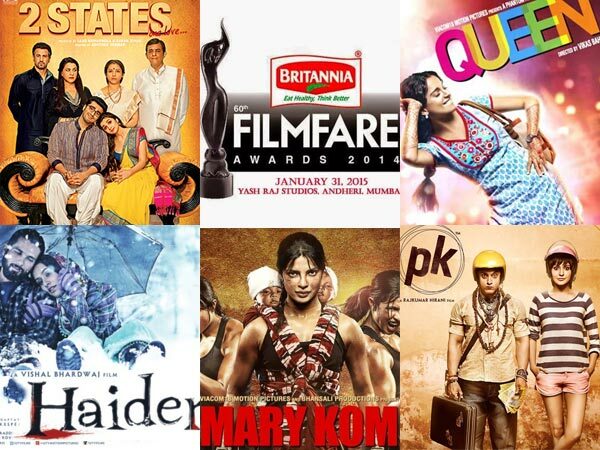 As a host Kapil is good but since it is Filmfare somebody with Filmi Background could have hosted it. I understand remembering the theme of the show [devoid of high-class delicacy and introducing amchi Mumbaiya accent and people] it was okay but still it’s not so okay. Earlier we enjoyed Saif and Shahrukh jointly used to co-host the show and it was entirely entertaining and hilarious. Both of them have amazing sense of humor. Even last year Ranbir Kapoor and Priyanka Chopra did a good job, specially Ranbir’s mimicry at the nomination [ of Bappi Lahiri and the side actor of Bhag Milkha Bhag] was simply awesome]. 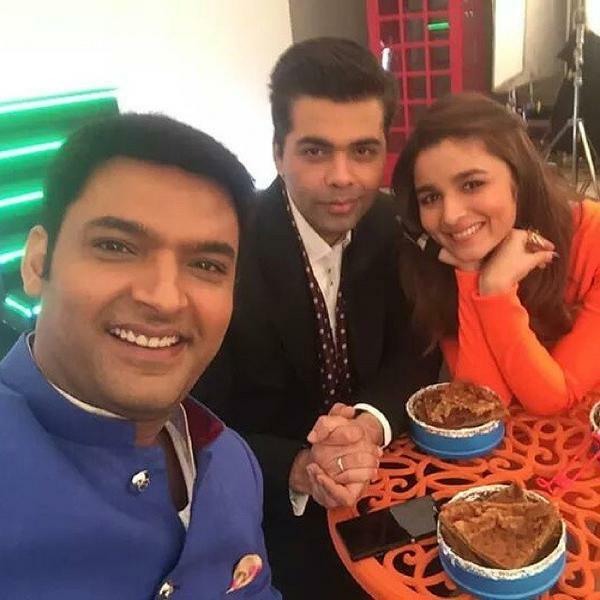 Coming back to this year, Kapil’s few witty comments[ Tabu and Haider co-stars] giving priority to local tailors than costly International famed designers…….all are okay but we did not like Dr Nene eating pani puri [ from Pishambar panipuriwala] and all those stuffs. Karan was good as he is always super smart in any role. Alia was cute. Coming back to stage performance I like Shraddha Kapoor’s dance performance. I liked veteran actress Kamini Kaushalji got lifetime achievement award. 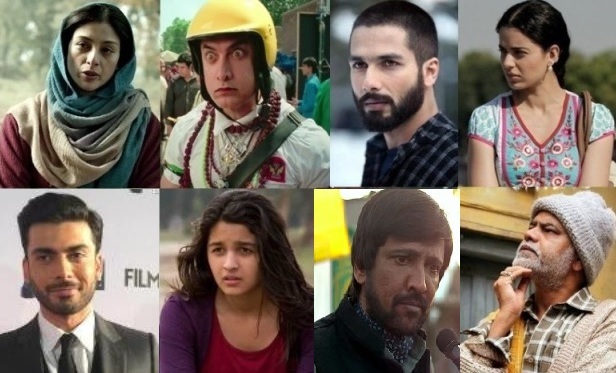 Shahid Kapoor[best actor, Haider ], Tabu, K K menon[ best supporting actors Haider], Kangana Ranaut [ Best Actress, Queen], Sanjay Mishra[ best actor critic award, Ankhon Dekhi], Vikash Behl[ director Queen], Rajat Kapoor[ best director, Ankhon Dekhi], Alia Bhatt[ best actress critic award Highway] are few good and well deserved awards. We always love to see Rekhaji in award function. The ceremony was not exception of her presence. We liked Madhuri Dixit ji, she was looking drop dead gorgeous[ May be the presence of Dr Nene made her look so]. 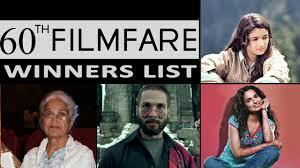 Filmfare award ceremony is very special for the viewers because we would love to see veteran actors and actress along with the newcomers. Even they[veterans] can take part in the stage performance[ so far their age and health permit], after all many of them have given super-duper hit movies and lovely song sequences which are assets of Hindi film Industry. It never looked funny that five of the guys are carrying the tail ending of Deepika’s gown with biting teeth. The charm was somehow missing. So far my assessment is concerned, Film Industry people are taking these kind of programme very lightly…………..no proper co-ordination nothing well knitted. Abrupt jokes,[ Kapil is still new], few funny moments but overall below average presentation. Only Karan Johar’s intellectualism has somehow saved the show partially. 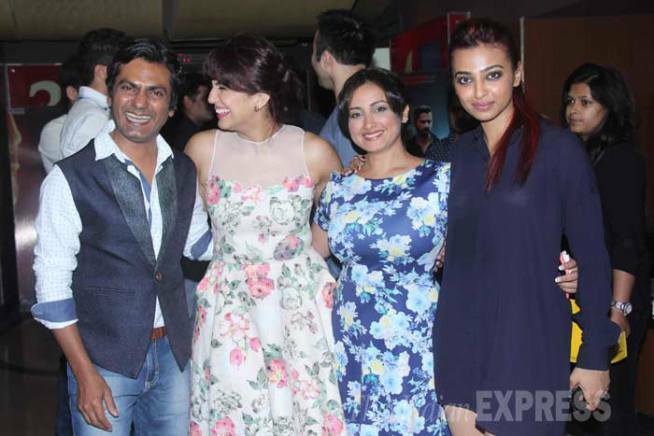 Viewers, don’t go by this innocent smile of Nawazuddin Siddiqui , he can outsmart anybody with any given script in any kind of role he acts. In Badlapur sometimes it seems we should scratch our foreheads to see him acting in such a mischievous way. Varun Dhawan is outstanding throughout the movie………….specially in the scenes of vengeance one should fear to see him acting such a dreaded way. Radhika Apte should do something with delivery of speeches. She should see a speech therapist as I feel she finishes the dialogue very abruptly which sounds very awkward. Otherwise she is okay. There was a magic mirror in Hogwarts where Harry Potter could see his parents…………the images are a bit hazy but they are very alive. Harry lost his parents in a very tender age…………………………that’s why he used to stand for long hours to see his parents in front of the mirror. Once professor Dumbledore was passing by when he saw Harry standing in front of the mirror looking intense inside. He then told Harry “It shows nothing more or less, it shows the deepest, most desperate desire of the heart”. Thats why it is Erised mirror which is spell desire just the reflection[erised] of it. Today 23rd February is PC Sarkar [senior]’s birthday. 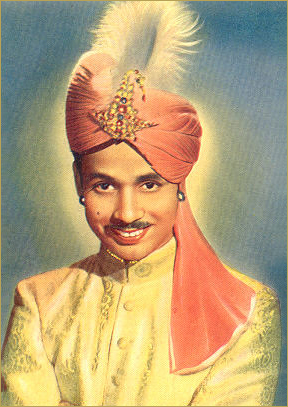 He was one of the greatest magician of India. Right from the childhood he had interest in Magic. Sri Ganapati Chakrabarty was his guru. His famous magic acts are “X-Ray eyes”, “Water of India”, “Sawing a human body”. I don’t want to intersect through this melodious song but wanted to say that I found Lata Mangeshkar’s version of the song more appealing. I always said its all about bowling ten good delivery……………..
My call would be for Priyanka Chopra for the role which Jacqueline played in the movie “Roy”. It could have been more intense with Priyanka. Anyway the whole movie otherwise cannot create the desired magic for which audiences were waiting to watch. Marvelous seascapes, lovely yachts, dense rain forests and wonderful teak-wood bungalows were the main attraction of the movie. I never liked Ranbir Kapoor’s one suit wonder look……………..[soliloquized dialogues had never create the usual charm of the hero otherwise.] Arjun Rampal was according to the scripts. [though utter nonsense in the application………………if you don’t have a girl/inspiration you don’t have a script ready for the floor……which is unconvincing enough] Overall I did not enjoy the movie at all…….. thought to see a signature thief in Ranbir Kapoor [ like Dhoom 2 Hritwik Roshan] but in vain.